When you’re in the midst of a web surfing frenzy, you will inevitably come across a ton of sites you want to look at later when you have more time. Quiet Read Pro is the perfect way to keep track of these temporary links. The internet is a terribly addictive place. We set out to do one task and constantly get sidetracked with fascinating content that has nothing to do with our initial mission. In order to stay on track, especially when time is limited, the best thing to do is set aside those cool sites and interesting articles for another day. But how? There are a couple ways people tend to save URLs for later viewing. First, of course, is taking advantage of bookmarks within the web browser itself. Just add a bookmark for that intriguing blog post and you’ll get to it eventually, right? Ha! I’ve learned from personal experience this method just hides links in a place I will rarely remember to go back to look at. Out of sight, out of mind. How about copying & pasting URLs with a brief description into a single text document? Too much work. Plus, having another window open all the time just creates more desktop clutter. One excellent solution is Quiet Read from bambooapps. Available in a basic free version and a more feature-filled $9.95 Pro version, Quiet Read is a menu bar application that makes it very easy to save & manage website links for later. It’s always there when you need it, but not intrusive to normal usage of your Mac. Here’s how it works: Come across a fun website, entertaining YouTube video, etc. Then select the URL in your browser’s address bar or click & hold a link on a webpage. 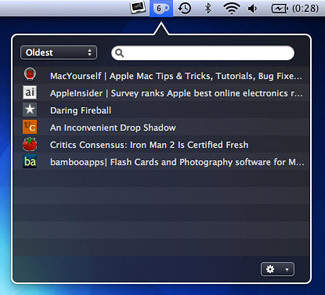 Now simply drag & drop it from your internet browser to Quiet Read’s menu bar icon. Alternately, you can drag this Add to QR link to your browser’s bookmarks bar so all you have to do is click it to send the current URL to Quiet Read. The best part – to me, at least – is that the menu bar icon also keeps a number count of how many URLs are currently saved in Quiet Read. So whenever you have a few minutes to kill, just glance at Quiet Read’s icon to see if there are any previously saved links you can check out. Then click on the icon and your list of sites will be revealed. There is a convenient option to “Open All”, but each URL can be double-clicked individually as well. Quiet Read has a number of additional features that makes it more functional to users. 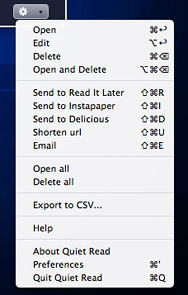 For example, keyboard shortcuts are available for opening, editing, and deleting entries. The $9.95 Quiet Read Pro can also send links to Instapaper & Read It Later, shorten links for Twitter sharing, search & filter the link list, and export to CSV. I thought about recommending folders for further organization, but that would almost defeat the purpose of Quiet Read. It is only meant for temporary link saving, not permanent bookmark storage. That distinction is what makes Quiet Read so good at what it does. Think of it as an evolving to-do list for browsing the web. Win a free copy of Quiet Read Pro for Mac! The developers of Quiet Read Pro (regularly $9.95) have been kind enough to offer free software licenses to 3 lucky MacYourself readers! To enter, please leave a comment below, along with a valid email address (this is how we will contact you). In order to avoid spam filter issues, please type a coherent sentence saying you’d like a chance to win. Make sure you’re running Mac OS X 10.6 or later since this application won’t work with anything older. Multiple entries will be deleted, so please only add one comment per person. And finally, don’t worry if your comment doesn’t appear on the site immediately — it might be awaiting moderation and will show up shortly. The winners will be chosen at random based on the comment numbers they happen to be. The lucky guys or girls will be announced on this page, so save this article’s URL and be sure to check back later. All entries must be made by May 12, 2010 at 11:59pm eastern U.S. time. In the meantime, download the free version of Quiet Read to try out its core features. Good luck! Congratulations to our winners Michael, Dodie, and Greg! Their comment numbers were chosen from a random number generator and they have each been given a free copy of Quiet Read Pro! Thanks to everyone who entered and remember to consider downloading a copy of Quiet Read yourself. Hey! I would love one of these! I’d love to win a copy. I’m always looking for a better way to manage bookmark/tab bloat. My current system involved a combination of Instapaper, Pinboard, and Google Reader (and the Reeder app on the iPhone). Sounds like a good utility. I have a generic “Surfing Stuff” bookmark folder in Safari, but this is a most unsatisfactory solution. Sounds like this app would be a great addition to my mac software library so please enter me into the competition! Thanks, David. Awesome! I hope I win! Keep up the awesome posts! Love to give it a try, I’m buried in urls and bkmarks. Wow! I really need this :)) MUST WINNN!!! From Italy… we love it… let’s try to win! Being 70+ years of age and not having such a good memory this seems a good way of being reminded of web pages one always “means” to go back to. Quiet Read Pro looks like a very useful application and I would be thrilled to win a software license. Will try the free trial version just to check it out but I am sure the paid version’s features are worth the price. Looks great! I’d love to win! Hi! I have craving for Quiet Read Pro for ever. I would love to win this please… Thanks god! I would love to win a copy of this for my boyfriend. I use his Mac all the time and this would help me stay out of trouble when I save links. Thank you so much! Been looking for an application like this. I will try out the free version in hopes that I win the Pro version. Thanks for the tip! Nice app! Would be great to see there an optional URL comment field AND OR tagging. I’ve been trying QuietRead for a couple weeks now. It’s one fantastic appliation! great tip – I am now trying the free version which is great so far. Pro would even be better. This looks like something I would find quite useful. I have a folder in Things that for this purpose but is so full that I can’t bear to look at it now. I use the free version and it is great for what it does. The Pro version has some useful extras but I haven’t really needed them.